When I walk the towpath near Lockhouse 44 in Williamsport, I ponder those whose footsteps I'm following. 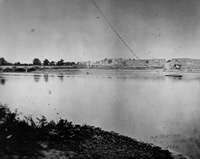 Tens of thousands have walked here before me, including barefoot 10-year old mule drivers leading their families' boats upstream to pick up more coal, lock tenders coming back from town with loaves of bread to sell to the canawlers, and Confederate soldiers marching east to the Falling Waters crossing to escape Union forces. I wonder what each individual thought, how they felt, what their dreams were. 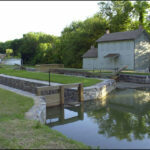 So much history was made here along the C&O Canal. The Civil War especially intrigues me because it is nearly impossible to imagine the 184.5-mile canal being between two countries, yet it was. Being in Maryland, the canal was on the Union side. 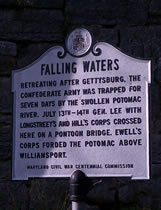 However, just across the Potomac River was Confederate territory. 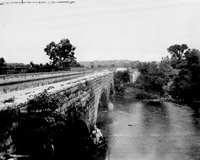 Throughout the war, the Potomac River and the C&O Canal were frequently crossed by troops from both sides, on the way to one battle or another. Although Lockhouse 44 was not built until after the war, the lock itself was operational with a storehouse and mill nearby. How unnerving it must have been here during a canon barrage with the echo of artillery reverberating over the water and through the trees, with tremors shaking both boats and buildings. There was also a constant worry about Confederates disrupting canal operations by raiding the stores, confiscating boats, or blowing up dams or aqueducts. 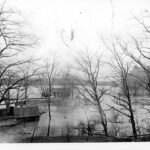 Right here at Lock 44 in 1862, the lock gates were burned along with eleven canal boats. 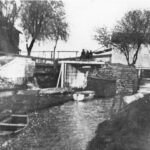 The following year the lock gates were burnt again and part of the lock wall torn down. The war definitely took its toll on the canal. Today, there is a tranquil stillness in the air at Lockhouse 44. But then I watch my feet walking gingerly on the towpath and I once again remember that it was not always so easy here. People who walked this same path before me worked hard and even fought hard to make what I enjoy today possible. It reminds me of how lucky I am.